Orlando Shakespeare Theater in Partnership with UCF kicks off its 2016-2017 Children’s Series with the beloved fairy tale, Beauty and the Beast, select dates June 16 – July 24, 2016. Adapted by Brandon Roberts (2015’s The Frog and the Princess and 2014’s Rapunzel), the family-friendly production is based on the classic French fairy tale. The Orlando Shakespeare Theater in partnership with UCF presents The True Story of the Three Little Pigs, March 27 through April 27, at Lowndes Shakespeare Center at Loch Haven Park in Orlando. This production offers audiences the opportunity to hear the wolf’s side of the story in this dynamite rock musical for the entire family. 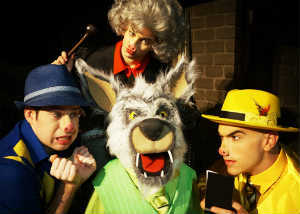 Alexander T. Wolf (aka the Big Bad Wolf) is accused of deplorable crimes. Facing a jury of his piggy peers and a tough-as-nails judge with a weakness for musical theater, can the Wolf ever hope for a fair trial? The audience decides the ending of this play – guilty or not guilty? Directed by Steve MacKinnon, this musical features actors Sophie Bell, Bridgette Hoover, Chris Metz, Jeffrey Todd Parrott, and Seth Wallen.